Highway 20 was very much a ghost town on my drive to the Easy Pass Trailhead. 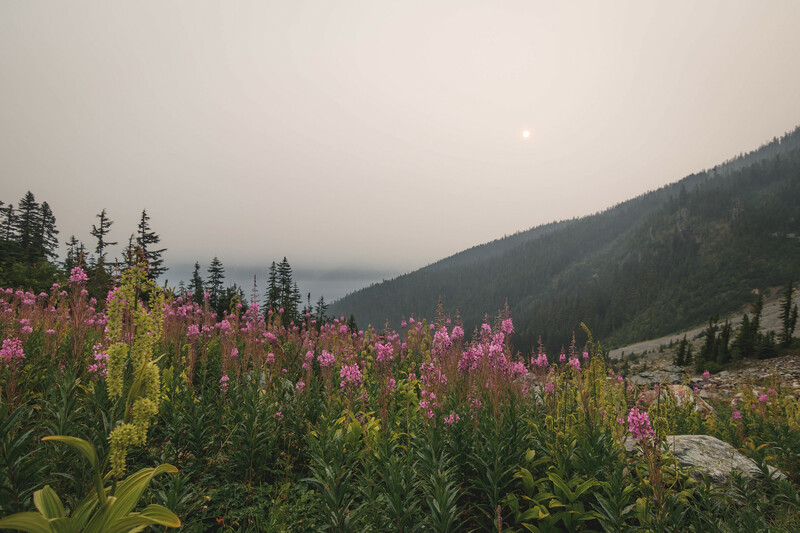 This summer the wildfire smoke was much worse compared with last year. Empty trailheads along the way seemed to suggest people abandoning weekend’s outdoor plans altogether. 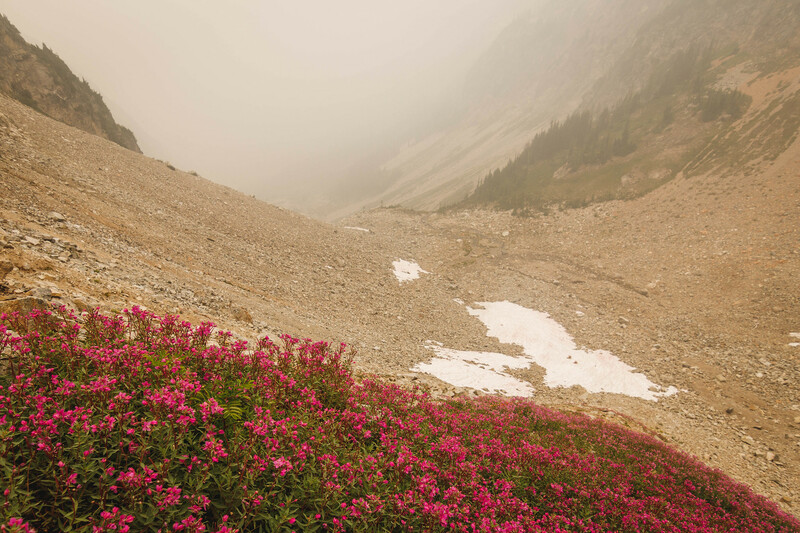 Morning hike to Easy Pass was eerily quiet and smoke heavy on an otherwise would-be gorgeous, sunny day. 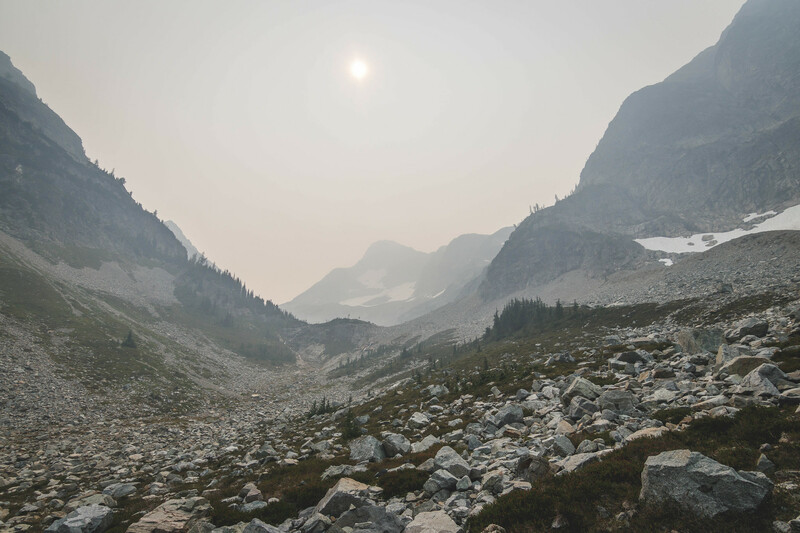 The amount of smoke on this trip was comparable to the last Labor Day weekend’s trip in the Pasayten Wilderness. 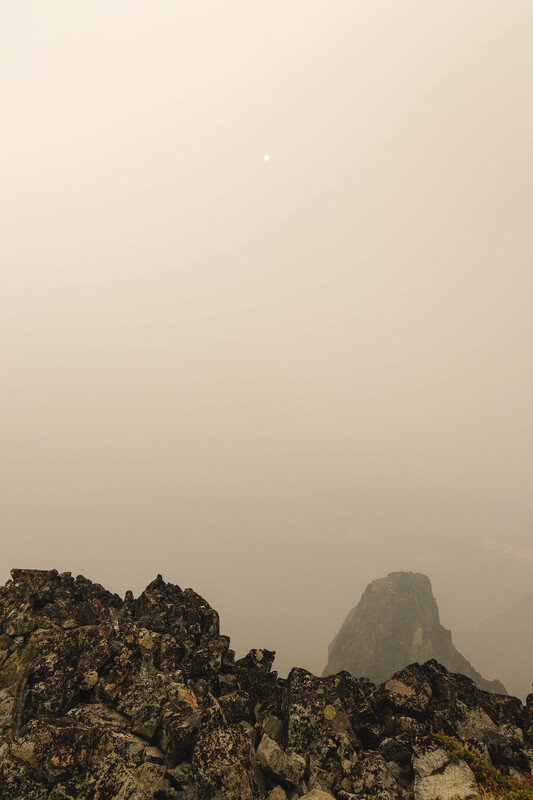 Air quality was as different as night and day compared with the Mesahchie Peak and Katsuk Peak climb. Back then views were at every turn, but today I was lucky to see anything beyond half a mile radius. 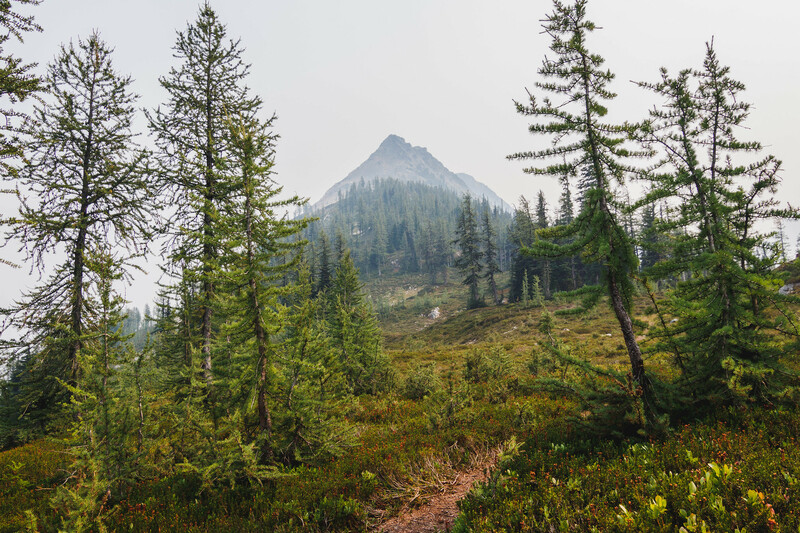 Without making many stops, I quickly hiked down to Fisher Camp Trail junction. Then I followed an unmarked trail upstream toward the head of the valley. Eventually, the trail dwindled at half a mile past the junction at. I crossed the creek to the south side and began the scramble. Following a faint trail occasionally marked by cairns, I was able to bypass the most talus. Later I discovered that the faint trail crossed over to the north side of the creek below the waterfall. But I remained on the south side, which worked out just as well. I spotted the gully mentioned in reports in the upper basin and avoided it. Just east of the gully was a steep access ramp with cairns above the scree to negotiate cliffs. 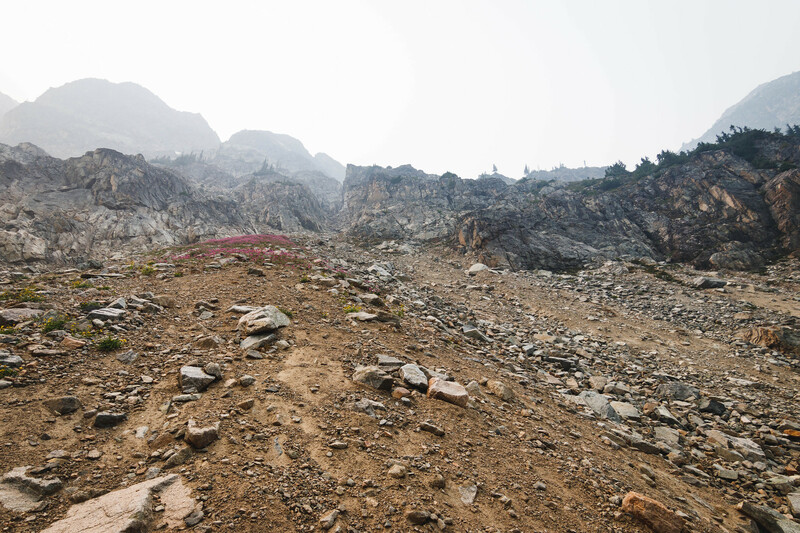 The terrain eventually flattened out just before reaching Upper Silent Lake at 6975′. Views at the lake comprised the lake itself and the mirage of Fisher Peak. After setting up camp and rested for a while, another climber showed up at the lake. We had a brief exchange before he continued on to climb Mount Arriva. Two climbers on an obscure peak in one day, what were the odds?! A short while after he had left I set off for Mount Arriva via the south lake shore. I headed southwest and maintained roughly the same elevation. Then I rounded off the south-trending ridge by a flat area at 7000′. There I made a rising traverse westbound through several minor gullies. Eventually, the cliffs at the top of another south-trending ridge at 7520′ stopped me in my tracks. After locating a class 3 steep gully, I descended to 7400′. 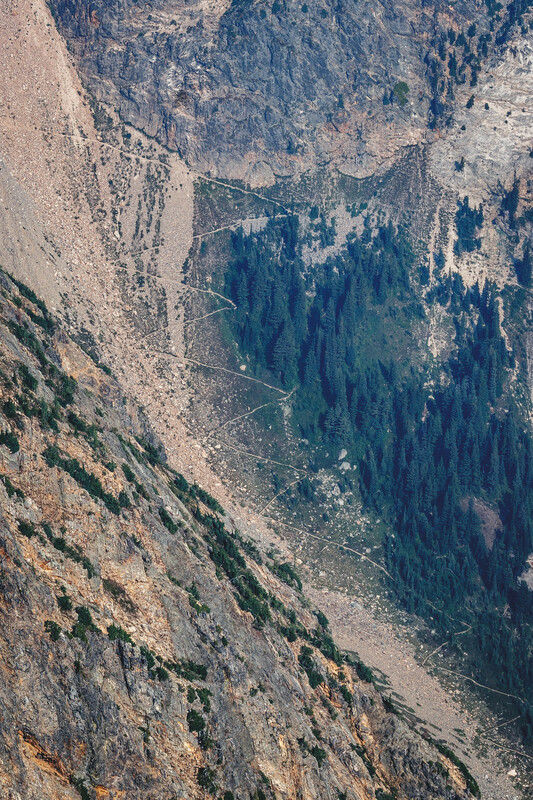 Then I made another rising traverse at the head of Grizzly Creek Basin below Mount Arriva’s East Peak. 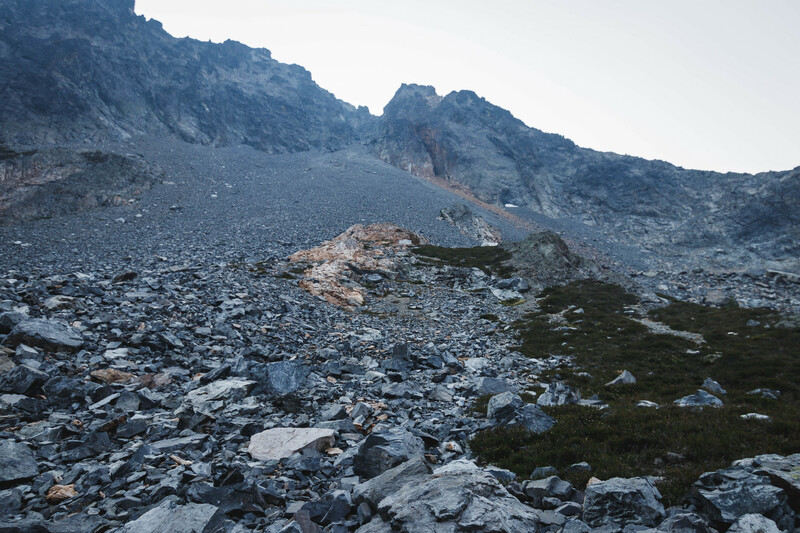 Most scree in the basin was avoidable by staying high. I hugged the cliff wall and reached the bottom of a loose rock gully. A 100′ ascent in the gully with solid holds put me on the 7800′ notch. 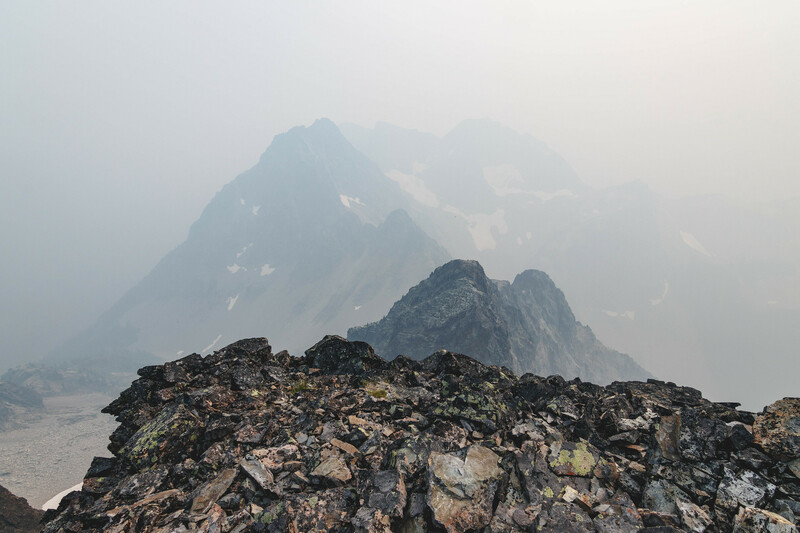 Guided by some cairns, I ascended the south ridge and arrived at the 8080′ notch east of the summit block. 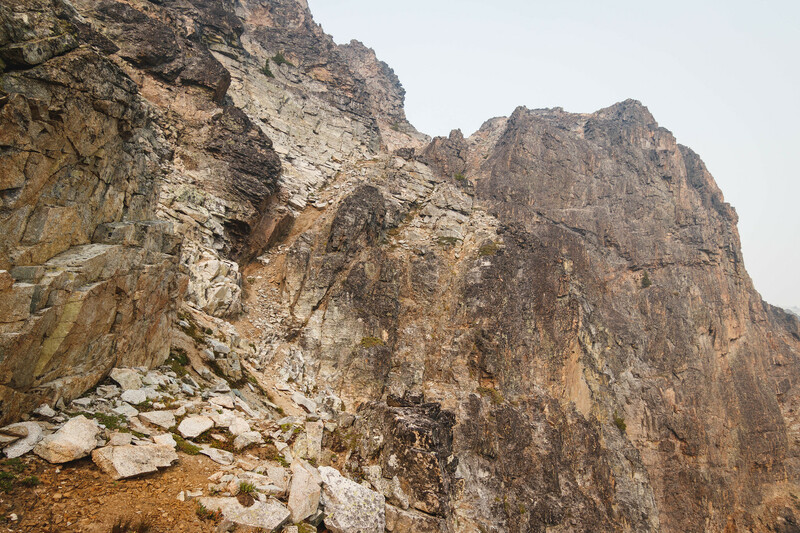 Then I traversed west on a loose rock ramp below the summit cliffs and got back onto south ridge. I somehow missed the one strategically placed cairn and traversed around the summit block onto the west face. Mostly cliffs with a nice ramp going around the west face but no good place to head up. I found a good place to get on the west ridge after traversing farther north around the west face. The view of Arches Peak was right before me. 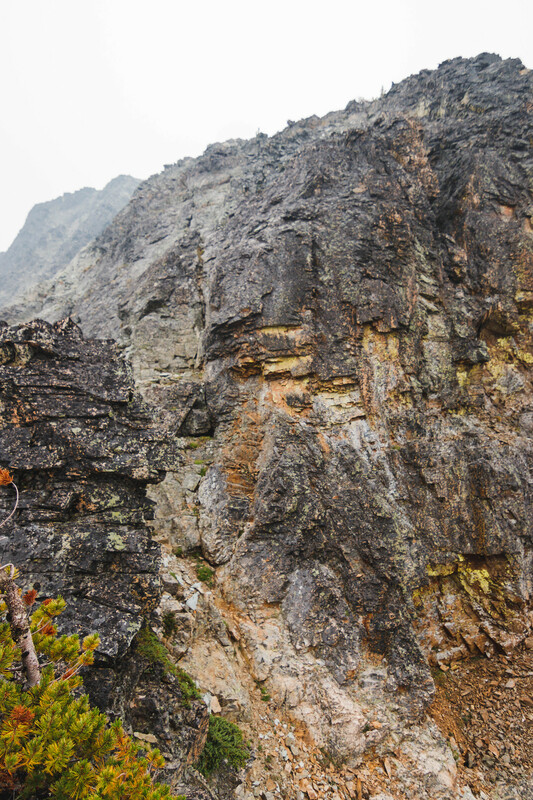 With good holds, I climbed the last 150′ on the steep, albeit blocky, west ridge to reach the summit. Just below the summit, I heard noises coming from the south side as if someone was sliding on scree. That’s when I knew the other climber and I had missed each other. 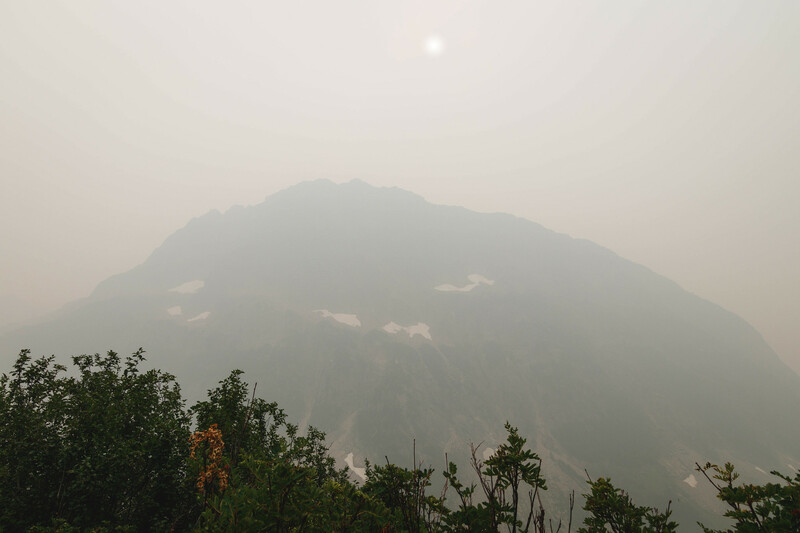 No views on this summit to write home about; the amount of smoke appeared to have increased since I left camp. I had to enhance the few photos I took of the ridgelines. Otherwise, they would appear nearly invisible. Alas, maybe another time for views! On the way down, I traversed low to bypass minor gullies and the two major south-trending ridges. 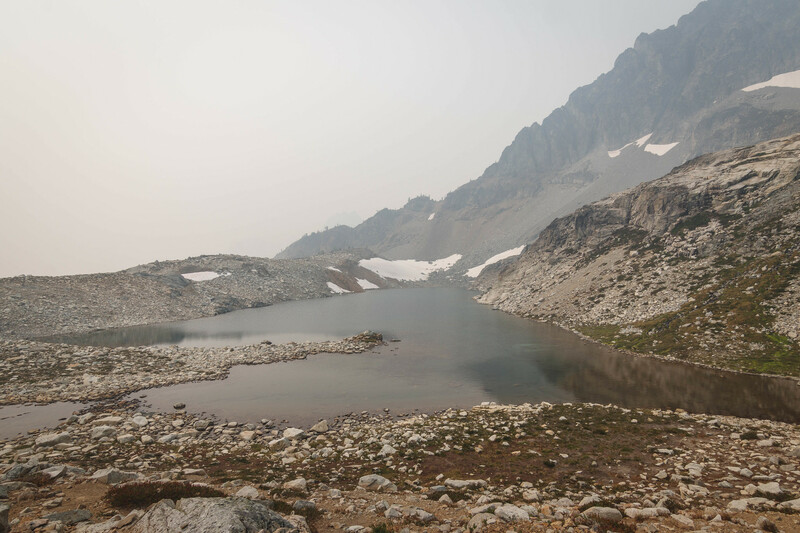 I plunge stepped through scree and two small snowfields in Grizzly Creek Basin to 7000′. Then I traveled east and maintained an elevation between 6800′ and 7000′. I once again saw the Upper Silent Lake. With plenty of daylight remaining I contemplated climbing Fisher today as well. But heavy smoke had drastically darkened the sky and made the approach a bit daunting. So with slight trepidation, I decided to stick around and kill time by chilling out camp and taking photos. Oddly enough, smoke never subsided overnight like on the other trips. I woke up during the night to the sounds of deer scouting out the camp and the smell of smoke. I poked my head outside anticipating a night sky full of stars. But Instead, the visibility limited to just a few feet. So I stashed the camera and went right back to sleep. In the morning I left camp early under a shroud of yellowish smoke. From what I’ve read in reports, the route to Fisher Peak was straightforward. Just a few knobs plus a 20′ tall, class 4 crux to get through. 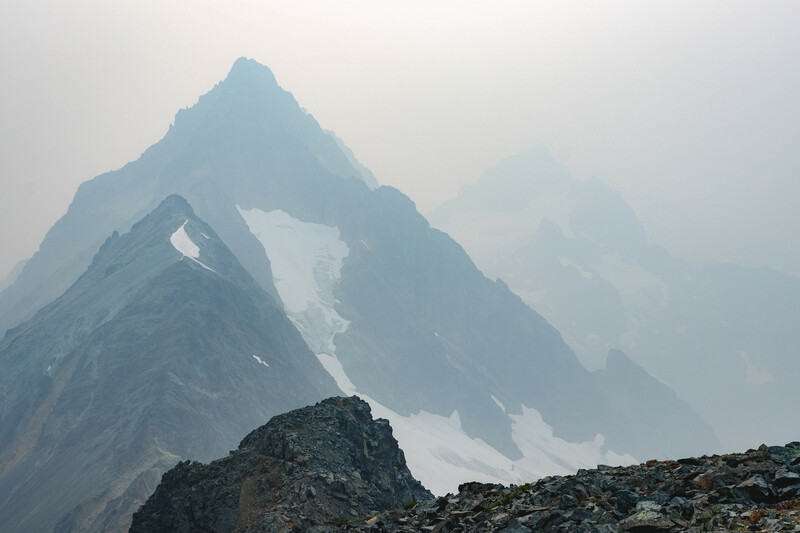 I got over all the ridge knobs including one I negotiated from the south on easier terrain. Eventually, I was standing before the class 4 crux at 7720′. This section turned out to be better than anticipated. Good holds and fairly exposed while overlooking the head of Fisher Creek Basin. Beyond the crux, it was right back to the same enjoyable class 2/3 traverse as earlier down on the ridge. A short exposed ridge run at the top to reach the summit marked by a short cairn. Nothing to see on this summit either. Since I still had to pack up and hike back to Easy Pass, I didn’t spend much time on top. I reversed the route and got back to camp in less than half of the time. A short break after packing and I quickly set off for Fisher Creek. Back in the basin, I followed a faint trail through the heather to the north side of the creek. That’s when I saw the faint trail crossing over to the north side below the waterfall. The trail gradually dwindled once I got onto a talus field past the heather. I crossed the creek back to the south side below the waterfall. 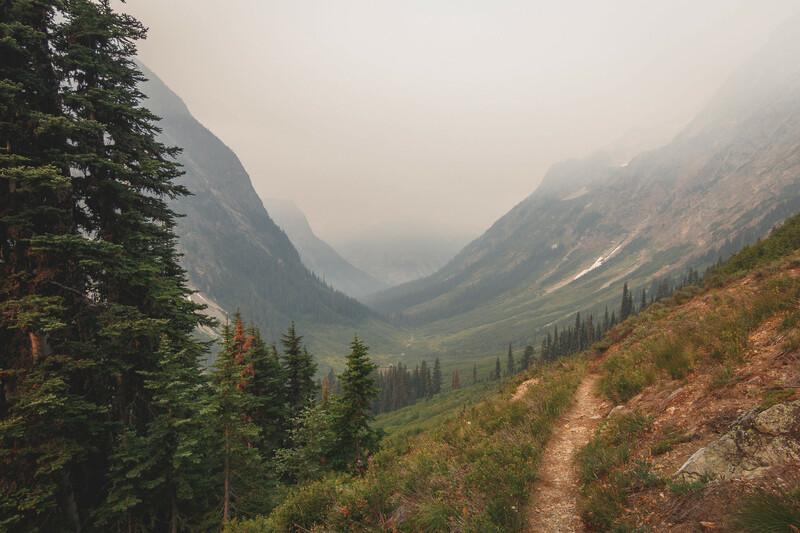 Then I picked up the faint trail and hiked down the valley in a blanket of smoke. By now Fisher Peak had long gone out of sight, the only high point visible was Arches Peak looming overhead. Back at 5040′, I crossed the creek and then picked up the faint trail to Fisher Camp Trail junction. From here, I needed to regain the lost elevation by ascending 1400′ back to Easy Pass. 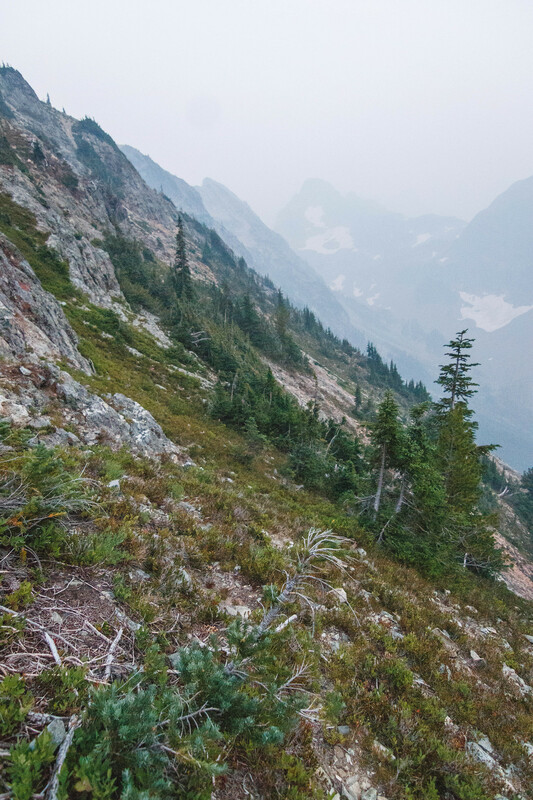 Back on the pass, I stashed most of the gear and started scrambling north toward Ragged Ridge. On the way, I met two climbers on their way back from climbing Mesahchie Peak. At 7100′ I began the tedious and long westbound traverse on steep scree slopes toward Kitling Peak’s south basin. I stayed close to the base of the cliffs for an easier traverse. I rounded the ridge west of Honeymoon Hump at 7300′. Then I headed north into the basin directly below Kitling Peak’s summit. 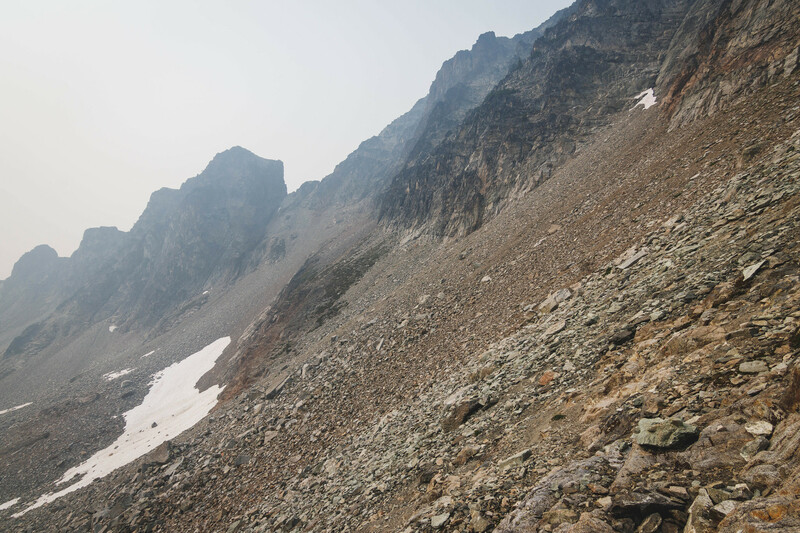 I arbitrarily picked one of the several gully options at 7400′ and ascended northeast to finish the last 600′. Of all four summits visited on this trip, Kitling Peak was the least technical. Though not much to see on top, views felt a little better than on Arriva Peak and Fisher Peak. 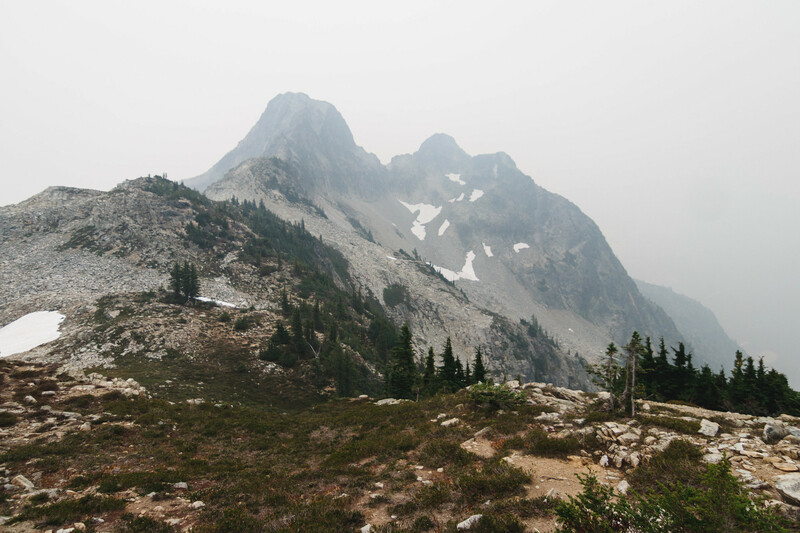 Only fully visible peaks were Mesahchie Peak, Cub Peak, and Honeymoon Hump. After a short stay, I descended back into the south basin and repeated the tedious traverse back to Easy Pass. 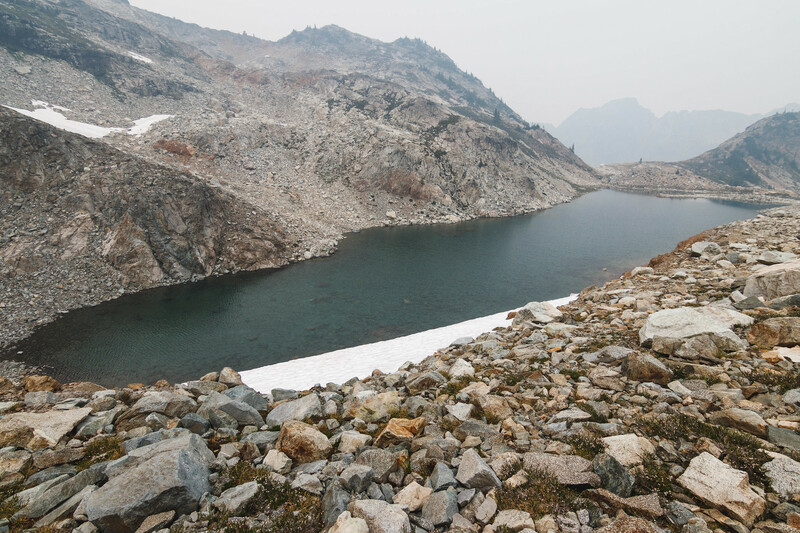 Without any water source on the pass, I retrieved my gear and headed for Graybeard Peak’s west basin. 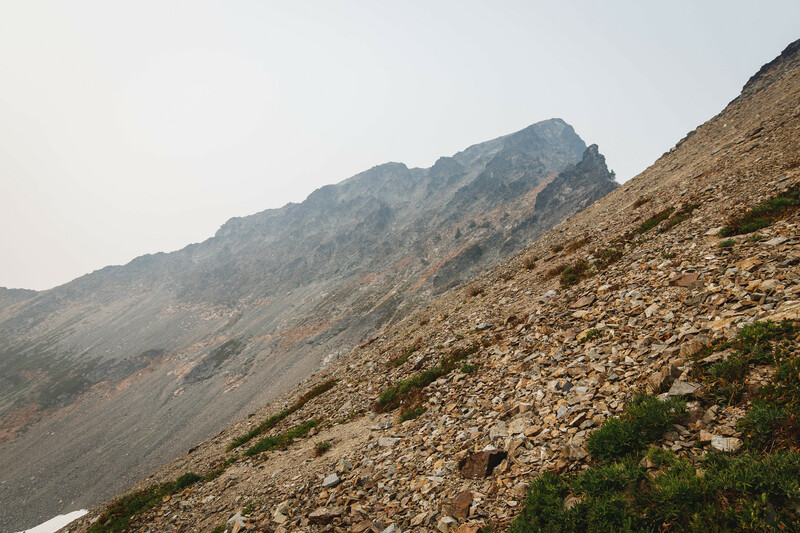 I left the trail at 6500′ and traversed southeast on steep heather and talus slopes. 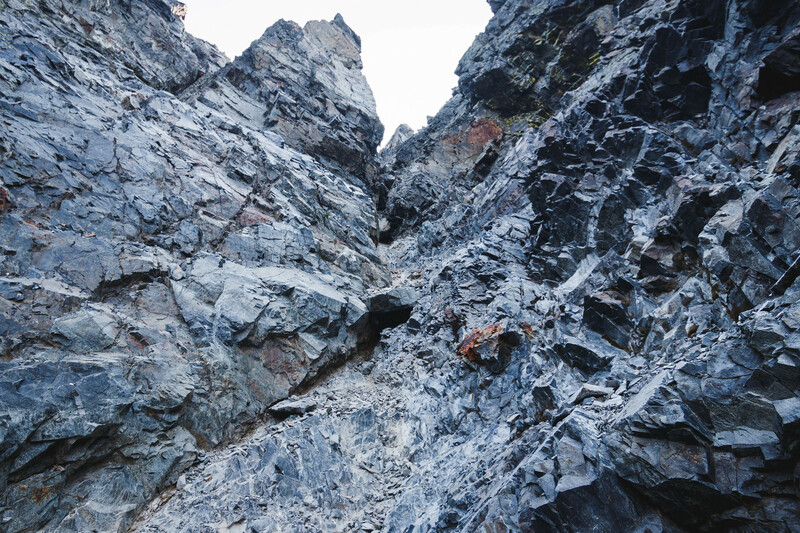 Maintaining the same elevation, I bypassed cliff bands before gradually gaining 200′ up into the basin just after dark.